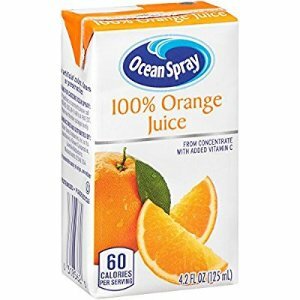 Amazon.com offers the Ocean Spray 100% Orange Juice 4.2 Ounce Juice Box Pack of 40 for $8.42 via Subscribe & Save to check out. Features：Enjoy the fresh, delicious taste of 100% Orange Juice with a daily dose of vitamin C in every single serve bottle. Daily dose of vitamin C. 100% fruit juice with no added sugar. No artificial colors. No preservatives or flavors. No preservatives, artificial flavors or sweeteners. From the Growers at Ocean Spray - Grower owned since 1930.